This trail runs around the edge of the marsh that forms the headwaters of King Creek which flows from there in a shallow bed, under 100 Avenue to the lake and from there to Bear Creek Park and beyond. A short loop trail which passes through a well drained knoll with a fine stand of Douglas-fir, which owe their size to having survived the logging of the 1920’s as young trees. At its junction with the Trillium Loop Trail stands Green Timber’s tallest Douglas-fir. Further along grows an isolated Yew Tree. This trail shares one side with the Trillium Loop Trail. Being in low ground, this loop is given over mainly to deciduous trees with a few evergreens, including a large Sitka Spruce with a broken crown. It has an abundance of shrubs and the ground cover is rich in trilliums and Wild Lily-of-the-Valley. The rare Rattlesnake Plantain is found in the area of the sluggish creek bed. This area contains the remnant of an experimental Scotch Pine plantation (Lot #16 on the Plantation Plan Map). Judging from its appearance this tree does not do well in our climate. 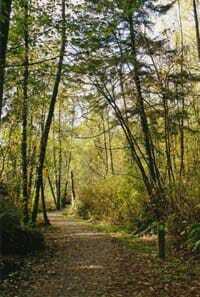 The trails contains a rugged loop with two spurs leading to 144 Street, plus a gravel section that connects across the Salmonberry Trail to the Trillium Loop Trail. This pathway follows the northern edge of 100 Avenue. It has access points to the Trillium Trails. This trail runs north from 100 Avenue on the old logging railbed before turning east to 146 Street. It connects with the Moss, Yellow Arum and Trillium Loop trails. 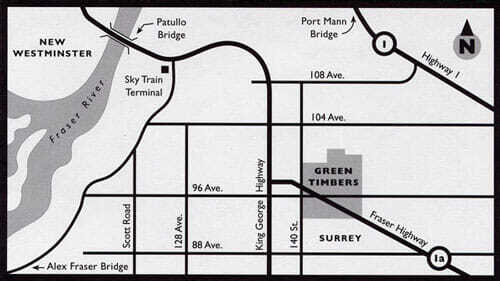 Salal Trail runs from 100 Avenue to 96 Avenue parallel to 148 Street. From 100 Avenue to Pine Trail the ground was too wet to be conducive to the growth of giant evergreens, as can be seen from the scarcity of old stumps. It was not replanted and is therefore treed with alder, maple and cottonwood. It has a dense cover of Salmonberry shrubs. South of Pine Trail are numerous nurse logs and stumps which nourish an abundance of Salal, ferns, and Huckleberry bushes broad-leafed Vanilla Leaf, False Azalea, and big-leafed spikey Devil’s Club. From Douglas-fir Trail to Pine Trail, this trail follows the demarcation between the mature coniferous forest and the young Red Alder and cottonwood which has grown in since the clearing in 1986. It will be interesting to observe how in time the evergreens which have seeded themselves from the cones of the old forest will take over. These are hemlocks with some red cedar, both of which are shade tolerant. The alder having nitrogen-fixing capability was first to establish itself and provided nutrient for subsequent vegetation. This is an excellent example of the forest “Succession” process in action. South of Pine Trail on enters a typical reforested stand which continues to 96 Avenue (Lots #51 and 55). West of the trail and still north of Cedar Trail is a patch of the rare Coral-root Orchid. Willow Trail follows the east bank of the wetland and the lake, around the south shore and on to 96 Avenue. At this time the trail still awaits final planting along the shoreline. The open meadow slopes will provide habitat for shrews and voles which are the favourite food of the soaring Red-tailed Hawk. Here the raven also flies over. Birch Trail follows the western edge of the wetland to the pump house where it enters a stretch of mature Birch and alder. Here the ground was too moist to sustain the conifer seedlings that were planted in Lt #51. The path follows the line of the buried cable which supplies the well pump house. These three trails provide east-west connections from 148 Street across Salal and Hemlock Trails to Willow Trail. Between Salal and Hemlock Trails stretches Lot #52, an experimental plantation of Eastern Red Pine, known for its hard wood. The copse has a sparse appearance with little undergrowth. The species appears unsuited to our climate. The straightness of Cedar Trail indicates that it was once a railway bed. A paved pathway which runs for 1240 metres along 96 Avenue from 148 Street to Fraser Highway. It has entry points from south to Willow, Hemlock and Salal Trails. A paved multi-use pathway which runs from the parking lot on 148 Street, crosses Fraser Highway and continues to 140 Street. At 148 Street a short footpath leads to 96 Avenue. Coyotes are a common sight in this open belt. 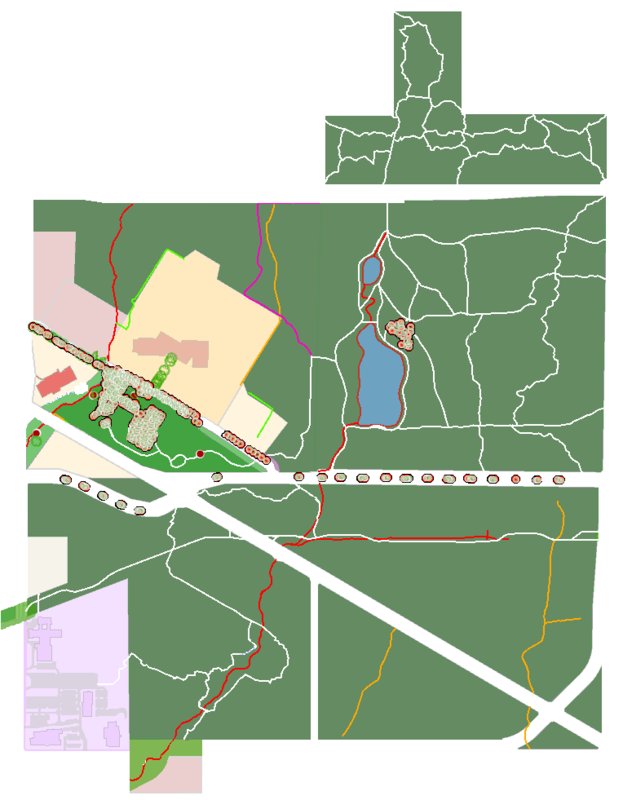 A project is underway by the Douglas College Urban Ecology Institute to develop the Right-of-Way into a “Green Link” from Tynehead Park to Burns Bog. These trails connect the Hydro Right-of-Way pathway across Fraser Highway. On the east portion are several rare Yew Trees. Rail bed Trail follows the old logging railway track, as can be seen form the ditches on each side. The abutment at the crossing of King Creek contains traces of the clinkers that were emptied from the logging engine’s firebox. Presumably this was also where it took on water. A good entrance point to this trail is where 92 Avenue ends west of 144 Street. The trail follows the east side of King Creek (named after the former King and Farris Sawmill in Newton) and goes through the best example of reforestation as it looks after 65 years (Lots #93 and 94). Here is found the occasional Indian Pipe plant. This trail runs along the west side of King Creek and connects Railbed Trail with the footbridge t the south. The forest here is a mix of mature evergreens, deciduous trees, overarching Vine Maple and ferns. The 8-foot wide hollow cedar log referred to elsewhere is located off a ten-yard side trail leading to the creek slightly north of the junction with Maple Trail. Maple Trail extends from Sword Fern Trail to the parking lot of the School Board Conference Centre. As this parking lot is on School Board property, it is not available when the gates are shut. 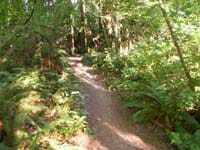 The trail shares the topography of the Sword Fern Trail which tends to be wet. Consequently, many seedlings that were planted there is Lots #95 to 100 were largely overtaken by naturally growing alder, birch, cherry, Broadleaf Maple, Vine Maple and cottonwood. Nevertheless, come Douglas-firs, which were young trees at the time of logging, being well, spaced with abundant light, have grown into some of the finest specimens in the forest.